It will cost you10% of the Racquet Selling price for you to demo a racquet. The full price of the racquet has to be paid while requesting the demo. After you demo the racquet you can ship it back to us in the same box that we shipped to you. Once we receive the racquet after your demo we will NEFT (direct bank to bank transfer) the money back into your account after deducting the Service charge of 10% of the Racquet Selling price. The cost of shipping the racquet back to us would be borne by you. Why do you charge me Rs 375 if I use a Credit Card or NetBanking ? Our payment gateway charges us up to 3% processing fee for credit card/Netbanking. It will not be possible for us to factor that as part of the demo costs. Why do you charge me Rs 323 when I use NEFT/Cheque DD to make the payment? When you checkout the Rs 323 will be deducted from the total so you will end up paying only the cost of the racquet. How long does it take to get the demo racquets and how long can I keep them? It takes two to four working days from the day we ship the demo racquets to reach you. You get to keep them for a week. If you receive them on a Monday, then you would have to ship them back to us the following Monday. If you receive them on Tuesday then you return them the following Tuesday, and so on. Note: Because demos may need servicing (stringing, gripping, etc.) prior to being shipped out, demo orders are not guaranteed to ship in the same time frame as new product purchases. Demo racquets may show in stock on your order but they may not be ready to be shipped immediately. Delays are only occasional and typically are no longer than one to two days. How do I return the demos to iTennis? We provide you with a return shipping label that you place over the existing label on the box you receive the demos in. You can then take the package to your nearest Indian Speed Post outlet and ship the racquet back to us. The cost of shipping the racquet back to us has to be borne by you. Please email us the return Tracking Number that is provided to you by the Postal Department. Note: Customers are responsible for providing a tracking number if returned by another shipping method. What if I forget to return them? We want as many people as possible to have a chance to demo these racquets so it's important that they're returned to us on time. If you ship them late, there is a late fee of Rs 200 per day. If you're more than 7 days late and we are unable to reach you, we will infer that you liked the racquet so much that you decided to keep it for good. 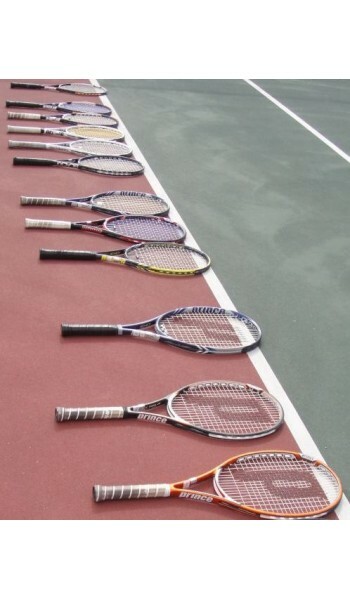 More racquets to follow based on your reponse. Please email sales@itennis.in if you want to see a new racquet in the list. If we get enough requests we will add it.